K-6200 machines offer superior maneuverability and a small footprint allows easy access to tight work areas. It comes equipped with either Inner Core cable or Integral Wound cable. Recommend 5/8" (16 mm) cable for 3" (75 mm) to 6" (150 mm) drain lines up to 200' (61 m). Patented Cable Control System – Causes the drum to slow down when the blade becomes lodged in a blockage. Limits potential for cable flip over. Direct Drive Design – 4/10 HP universal motor and gearbox bear down as torque builds. Audible warnings let operator know when blockage is encountered. Drum requires no adjustments to stay aligned and tight on drive shaft. Easy Maintenance Construction – Separate drum and machine in seconds. Inner drum and guide tube remove easily to maintain or replace cable. Designed Durable and Stable – Low center of gravity frame design and custom kickstand keep machine firmly anchored during operation. Rugged, corrosion-resistant polyethylene drum is rust and dent proof. Double tubular frame is lightweight and designed for extra strength. AUTOFEED® Control and Standard Accessories – Powerful feed mechanism is built to last and is easily maintained. AUTOFEED control, toolbox and selection of cutters included in all models. Line Capacity 3"- 6" (75-150 mm) Lines, up to 200’ (61 m). Drum Capacity 100' (30.5 m) of 5/8" (16 mm) cable. Weight (Machine & 100’ (30.5 m) of Cable) 180 lbs. (81.6 kg). Size Length 29 ½" (75 cm, Height 43 ½” (110 cm) (max. ), Width 18 ¾”, (47 cm). Type 115V/60 Hz, 5.6 Amp, Reversible, Universal AC Motor. Rating 4/10 HP, 285 RPM. CSA approved. Approved to UL standards (NRTLC). K-6200 Drum Machine is rated 4.7 out of 5 by 6. Rated 5 out of 5 by JacoV from Awesome easy to use Can’t be any happier about my awesome k-6200!!! Easy to use, light weight by still doing it his job! And don’t forget it’s a SUPER RIDGID PRODUCT!!! Rated 4 out of 5 by Bradleyman from Small Town requirement I found this machine, the K-6200, to be a necessity for small town sewage blockage needs. However it is very heavy and could use a modification on the handle as it catches while lifting and sliding it onto the tailgate of my midsize truck. ( the cross bar catches) I have now used this machine for 6 years and only had to replace the vacuum switch once and the cable (100') once. So it is a pretty tough machine. Rated 5 out of 5 by westplumbing from Great Sewer Machine I have been cleaning sewers & drains forc34 years as a professional plumber,. 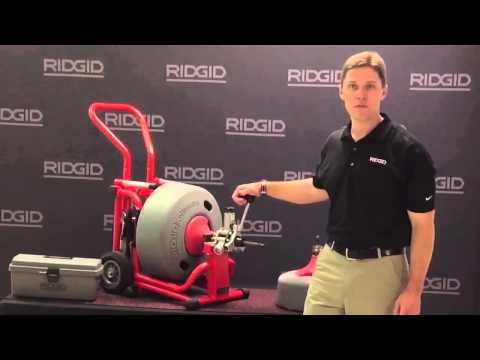 In that time I have used many different types of equipment, but nothing matches the Ridgid Brand Sewer & Drain Machine. They are very easy to use. Negotiating basement steps are a breeze with a Ridgid. I have young Ridgid machines to be very versatile in all applications. 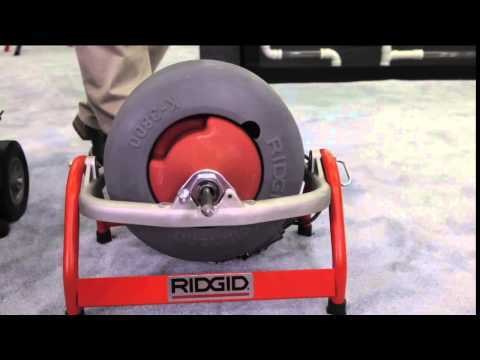 Ridgid machines are extremely dependable, never failing me in the middle of cleaning a sewer or drain. I love Ridgid Cables also. They do not bend or break like some of their competitors cables. I have owned and operated many machines thru the years, and Ridgid products stand the test of time. I highly recommend Ridgid! Rated 5 out of 5 by markus from well design and durrable This product. Is worry well design user friendly and easy to use almost end one can use it this is what professional plumbers using to cut out tree roots that penetrated into clay drained pipes product comes with set of cutting knifes that are strong and able to unplug even the worst stu on clogs overall product well made and user friendly. I use it al the times and recommend it. Rated 5 out of 5 by kzilke from Durable and Reliable I outfitted my entire service team with one of these on each service truck almost 14 years ago. Aside from maintenance and some minor repairs... they continue to perform strongly today. I highly recommend these machines for commercial use. What does &quot;CSA Approved&quot; and &quot;Approved to UL standards&quot; mean exactly? Which standards are we talking about? With regards to the cable? Hello again, thanks for your patience while I looked into your question further. Please see information below and let us know if you have any further questions. &ldquo;CSA Approved&rdquo; means that the product has been approved by CSA (Canadian Standards Association) to the appropriate CSA standard for that product. &ldquo;Approved to UL standards&rdquo; means that the product has been approved by a third party test agency to the appropriate UL (Underwriter&rsquo;s Laboratory) standard for that product. In this specific case, CSA did the evaluation to the UL standards. Specifically for the K-6200, the current standards are CAN/CSA-C22.2 No. 745-1-95 Safety of Portable Electric Tools - Part 1: General Requirements CAN/CSA-C22.2 No. 745-2-35-95 Safety of Portable Electric Tools - Part 2: Particular Requirements for Drain cleaners - 1st Ed UL 745-1 (2nd Ed) UL Standard for Safety for Portable Electric Tools - 2nd Ed UL 745-2-35 (2nd Ed) UL Standard for Safety Particular Requirements for Drain Cleaners - 2nd Ed The standards are not specific to the cable. we may have to auger more than 100' on a specific run. Thank you for contacting RIDGID. Yes, the K-6200 is able to work with in 3 - 6 &quot; lines with 5/8&quot;cable up to 200'. You would need an additional drum assembly with pigtail (cat # 95802) and a 100' cable.